We’re warming up to the idea of Jeremy Renner as the latest trainee in the ultra-secret Bourne spy program. Nothing against Mr. Renner, who was outstanding in such films as The Town and The Hurt Locker (and held his own alongside some titans of personality in The Avengers). Matt Damon just gave Renner some massive shoes to fill. How does Renner get a head start in winning us over? 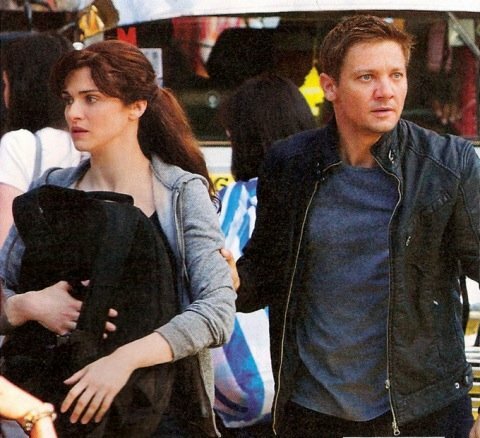 Well, grabbing Rachel Weisz as a co-star for The Bourne Legacy is a great start. That photo is in the latest issue of Entertainment Weekly (and shared via The Playlist), giving us a shot at Renner’s spy as he evades … something in an effort to protect Weisz. Basically, this is Bourne with most of the major pieces in place save for Damon and director Paul Greengrass. But longtime Bourne screenwriter Tony Gilroy takes over in the director’s chair (after helming the excellent Michael Clayton with George Clooney), so we feel like the franchise is in good hands. In addition, such key players as Joan Allen, Albert Finney and David Strathairn are sticking around to play the forces pulling Renner’s strings from a shadowy government agency. And Weisz isn’t the only welcome newcomer. Edward Norton, Oscar Isaac and Stacy Keach factor into the new ensemble. This is shaping up to be The Avengers of double-crossing, amnesiac espionage thrillers. If you weren’t aware, the new Bourne Legacy doesn’t reboot the franchise by pretending the previous films didn’t exist. Rather, it says that Damon’s spy wasn’t the only one in the program, them shifts focus to Renner’s new killer, named Aaron Cross. The action unfolds on Aug. 3. What do you think?